You may have wondered why 100% cotton décor fabric often says dry clean only or dry cleaning recommended. And if you do wash it…? 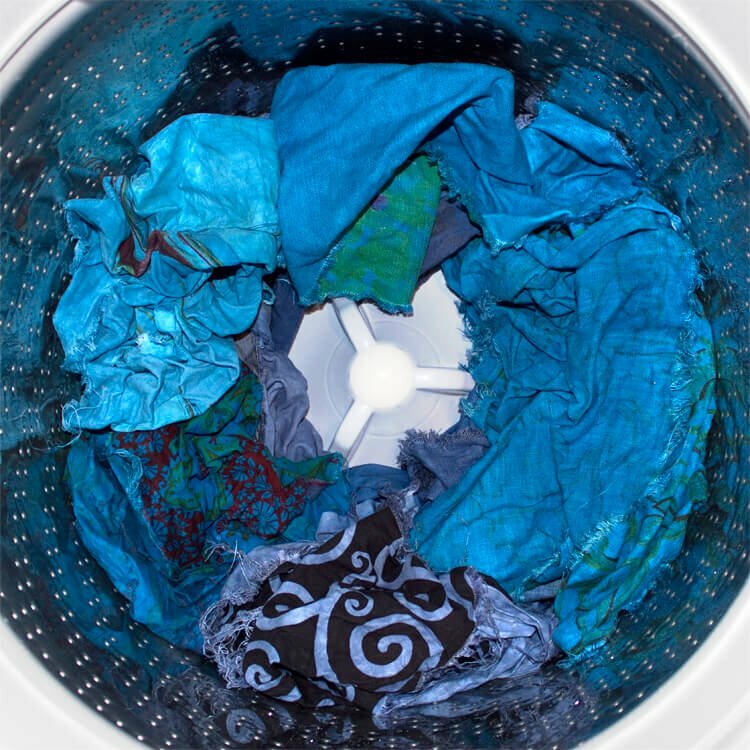 We’ll explain what may happen if you decide to machine wash your fabric. As long as you know the possible consequences, you can make your own decision. This article is specifically about 100% cotton home décor weight fabrics, but the same is often true for other natural fibers, like linen, or blends. We recommend caring for your fabric in the manner the manufacturer specifies. This way your fabric has the best chance of staying in its original condition and looking great for a long period of time. However, many people do wash their 100% cotton décor fabric. Cotton is notorious for shrinking. While clothes are usually pre-shrunk, décor fabric is often not. Even if washed in cold water and air dried, your fabric will likely shrink a certain amount. As long as you’re prepared for this and get a little extra, this shouldn’t be a big issue. The percentage it shrinks will vary. If you do plan on washing your fabric, ALWAYS wash it before starting your project. If you make it first and wash it later, you could have curtains that are too short or cushions that are too small. Most décor fabrics have a finish or “sizing” on it that serves several purposes. It creates a smooth coating that gives it some stiffness and body and could also have a slight sheen. Washing the fabric will remove this finish and it may look a bit duller and could feel softer and fuzzier. It may not hang as smoothly, looking slightly crinkled. Giving it a good iron can help. The finish also protects it from staining. Be aware that you will lose that protection if you wash it. There are products you can apply after washing, like Scotchgard Fabric & Upholstery Protector, for similar protection. The dye used for décor fabric isn’t always colorfast so the color may bleed. This could be particularly noticeable for fabrics with white backgrounds. Repeated washings will likely fade the colors. What you’re using the fabric for and where you’re using it is a factor. Curtains usually don’t need to be washed unless they’re in a potentially messy place, like the kitchen or kids’ playroom. You might consider washing cushions, pillows, and other items that are more vulnerable to spills and dirt. While we still recommend dry cleaning when specified by the manufacturer, if you do decide to wash your fabric with the effects in mind, hand wash or machine wash on cold with a mild detergent on a delicate cycle and air dry. Some people tumble dry on low heat, but it’s rough on the fabric and the heat could damage the fabric. No matter if you wash the fabric or have it dry cleaned, it’s best to do so as little as possible. Washing repeatedly will wear out the fabric faster. Regularly vacuum the fabric to keep dust or pet hair off and spot clean when necessary. Use a cleaning solvent that isn’t water based if you’re dry cleaning only. You can test out how washing affects your fabric on a smaller piece before washing all your fabric. And again, if you do decide to wash it, always pre-wash the fabric before starting your project. Now that you know what may happen if you wash “dry clean only” fabric, you may be perfectly fine with the consequences, in which case, go ahead…at your own risk! Click here to find the décor fabric for your next project. What is recommended to protect quality fabric used for drapery in kitchens? If a spray-on is used will it damage the fabric in any way? BEST ANSWER: A spray product like Scotchgard Fabric Protector should work well for most fabrics. We suggest testing it first for colorfastness. Spray a hidden area until wet and wipe with a white absorbent cloth. If color rubs off, don't use it.